Fantastic Ocean views from this beautifully appointed spacious brand new three bedroom condo, Featuring TILED floors, tile baths, gourmet kitchen, custom paint and professional decor. Relax on your private tiled deck and watch the beautiful ocean and smell the salt air! The Stockton Beach House is an upscale oceanfront building offering Adult and Kiddie heated pools and spa for your enjoyment not to mention the roof top deck with a panoramic view of the entire bay and beach. It sleeps 10. 3 bedrooms and 2 and half bath. Check in 3.30 pm. Check out 10 am. If you cancel before 90 days move in date , there will be 50% refund. After that there is no refund. IT IS A OCEAN FRONT BUILDING. IT WAS BUILD IN 2008 . SWIMMING POOL OVER LOOKING THE OCEAN. SECURE AND SAFE. ONLY 23 UNITS. the balcony has ocean view . 2 PARKING SPACES , BACK TO BACK . FULLY LOADED KITCHEN WITH POTS & PANS , DISHES . POOL ON THE GROUND LEVEL , WITH REST ROOM ON SIDE. KIDS MUST NOT USE THE HOT TUB. this condo is ocean view. it has a nice balcony ,which can be assessed from family room and master bedroom. The unit we stayed in was not well maintained. Kitchen was not well equipped, every cabinet was a chaotic mess, pots and pans cheap, scratched, and falling apart. There were 3 wine glasses, all mismatched. Knives were cheap and dull, eating utensils in a drawer with a broken organizer. Ice maker in freezer was broken as well as one of the dining room chairs, both mentioned in previous week rental review and remain in need of repair. All dining chairs have filthy upholstery. Furniture throughout the unit is dated and mismatched. There are no blinds in the master bedroom which receives the morning sun and the sheer curtains are hung backwards. The entire unit is in need of a paint job and the previous paint job is sloppy. The cabinets in the bathrooms have detritus which appears to be from previous renters. Not one toilet paper dispenser had a roll and there wasn’t even a courtesy trash bag in the kitchen can to get us started until we unpacked. There were no bath mats and the four shower heads were disgustingly dirty with green, crusty nastiness. The comfortor in the second queen bedroom was for a full size bed and there was nothing decorative on the walls. A mirror in this room was leaning on a low dresser. The deck, which has an ocean view, is completely overcrowded with mismatched chairs and an old, dirty, small, resin table. The unit was not clean. I found a rectal suppository on the floor next to the toilet. The storage closet in the garage area was completely full of old beach stuffs in a very unorganized manner. This is the first time I have been disappointed in a VRBO rental. Do you like to waste your money? Then this is the condo for YOU! If I could give this property zero stars, I would. I contacted the property owner about in regards to my dissatisfaction about the unit, in particular the cleanliness of the unit, and he/she said he would send the cleaning service over the next day to "straighten this out." When I reached back out to the property owner the next day, he/she said the cleaning service would not be cleaning the unit until we finish our stay. I then asked the property owner to have the cleaning service clean the unit since it was apparent it wasn't cleaned before check in or I would like to have the cleaning free refunded. The owner of the cleaning service came and went over the kitchen floor and counters which barely made a different. The owner of the cleaning service said she had spoke to the property owner numerous times about the cleanliness of the unit and that it needed work done, but the property owner didn't want to spend the money. I submitted a property complaint through HomeAway in regards to this unit. I would advise that you DO NOT stay at this unit even for one night. We've rented from Stockton Beach House before and never had this experience. If you plan on staying at Stockton, do not rent from this PROPERTY OWNER. The owner is selling this unit and obviously doesn't care about the individuals who are renting it for the time being. ALOT OF MONEY WASTED ON A DUMP OF A UNIT. PLEASE rent elsewhere. This building is 9 yrs old. This unit started rental 5 years ago. It was a model unit for the Stockton. It was furnished by professional. It is only rented 10 weeks a year. I have other 5 units which I am renting since 1994 At president condo. The cleaning device that cleaned is cleaning most of the units at Stockton since last 5 years . We had no complain. I did put the unit for sale but I maintain all my properties. You always take care of property especially when it is on sale. I own 5 more units at stock. My brother owns 2. My friend own 4 units. I think you rented my other unit at Stockton . I have been renting my units at Stockton for 9 years , no complain. The condo is gorgeous, proximity to beach amazing. The condo is furnished with everything you could possibly need, for the beach, the pool, everything. I hope we are fortunate enough to be able to rent this next time. Thanks Daksha! Best stay on Beach house for our weekend. Best ocean view from Balcony as enjoyed in morning.Very easy access to the beach as we came out of elevator. Beach house is well maintained and decorated and felt like your own house. 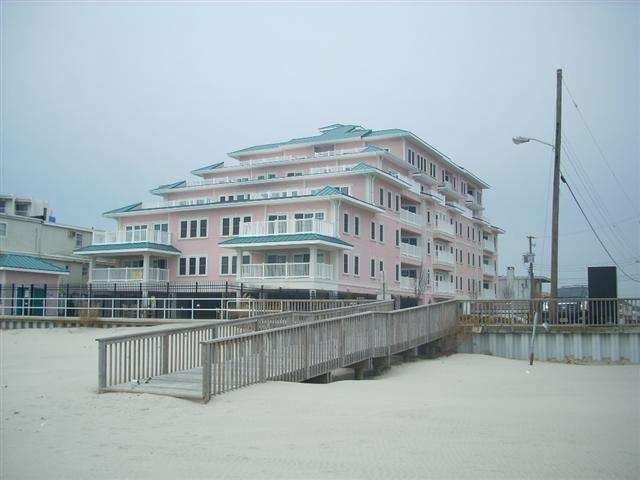 Beautiful spacious condo on the beach! We rented this condo for 1 week in July while we were in WildWood, the condo itself is beautiful, spacious, clean and well equipped. A few steps from the beach it was the perfect place to stay, we enjoyed buying and cooking fresh seafood directly at the condo and having family meals together in the dining area. The balcony is big enough that we could all sit together and relax to the sounds of the ocean; the swimming pool was great too! I highly recommend it! Southern Shore Area, offering Wildwood's famous Beach and Boardwalk. Great Restaurants close to Cape May and Atlantic City.